"Your gift is in putting your research in such a moving way that it comes alive, never to be forgotten"
Whilst at the National Archives last week I met up with Richard van Emden for a coffee and he gave me a copy of his latest book, Tommy’s Ark: Soldiers and Their Animals in the Great War. I had been eagerly waiting for this as I had done a good deal of research for Richard on this book about a year ago and wanted to see how this fitted into the finished product as well as look at the reams of material that Richard had found. I was delighted with what he and Bloomsbury have produced. 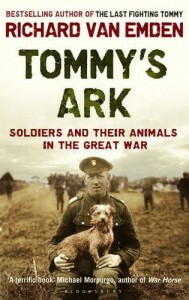 The jacket cover is in the same style as that used for Richard’s recent books with the same publishers, The Last Fighting Tommy and The Soldier’s War and shows a small dog, Sammy, the mascot of the 1/4th Northumberland Fusiliers who travelled out to France with the battalion in April 1915, served at Ypres (where he was wounded and gassed), was buried by shellfire on a number of occasions and later served on the Somme. Just this description gives some idea of the strange and amazing stories that the book contains. I really cannot wait to get stuck into it as soon as my current read is finished. When Richard and I were discussing how the book would work we identified various potential pitfalls to overcome; the main one being to avoid repetition. Having found many thousands of words of quotes myself I know the variation there is regarding these animals. Subsequent conversations and a good look through the book has confirmed my thoughts – there are such a wide range of stories that the reader really won’t be disappointed. My favourites (from the ones I found) are the old lady keeping bees on the lower slopes of Vimy Ridge in 1916 and the officer who tried to smuggle his beloved dog ‘Teddie’ back to Blighty at the end of hostilities. The images are terrific too – monkeys, dogs and kittens in the trenches as well as a collection of exotic mascots including a full grown bear! I am sure it will sell well, particularly in the UK, as we have such an affinity to animals. Witness recent news items with the reactions to any instances of animal cruelty – I have seen people get more upset over the welfare of animals than people! 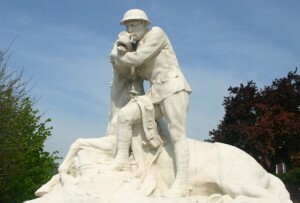 Even on battlefield visits the wonderfully moving 58th (London) Division Memorial at Chipilly with its depiction of a soldier comforting his wounded horse has reduced some visitors to tears. A quick word about conducting research for the book. Richard asked me to help him in finding animal stories in letters, memoirs and diaries. When I worked on the IWM panorama books Somme, Passchendaele and Arras with Peter Barton research was relatively easy, albeit time consuming. I visited over twenty different regimental museums around the UK as well as the Liddle Archive and many countless days in the Department of Documents at the IWM. My research was always tailored to a battle so I could use the archive search facility (if they had one!) for e.g. Somme or Arras. I also had a good knowledge of battalions, brigades and divisions which had served in each battle so could focus my reading that way. However, searching for stories involved animals presented many challenges. Only the most obvious stories were included in any précis of a collection – these were secured straight away. Subsequent research was on a more ‘hit and miss’ nature. The IWM holds so much material but, from my time spent there, I knew that certain memoirs were better written than others or that the writer had a particularly inquisitive mind and keen eye. It was these that I began with and, more often than not, I was rewarded with an animal story. On occasions though I recall a hard afternoons speed reading of hundreds of pages of memoir, letters or diaries and nothing to show for it other than a headache and blurry eyes. I shudder to think how many words we read in order for Richard to get the requisite 100,000 words but it was all interesting stuff – the hardest part was not getting waylaid on other interesting stories that one came across. Jeremy Banning | freelance military historian and researcher | contact | ©2013.